The rocket is a rotary design with integral single stage centrifugal pumps and regenerative cooling. The design for the next prototype is above 2000 lbf nominal thrust burning LOX/propane both at 95K. Rotational velocity at the injector is 300m/s. The combustion chamber is nominally 2,500 psi, discharging through nozzles angled to give the proper spin. Expansion through the rotating nozzles is incomplete, further expansion takes place in a nonrotating bell nozzle, which as it is shock wave coupled can be gimbaled separately. Thrust/Weight is >500, and Isp should be over 300 given the combustion chamber pressure. These data are approximate the design is still being tweaked. Cooling is through free convection of both the fuels at .25 to 1 million g. This is sufficient to keep the temperatures of the cold wall to within 5K of the cooling fluid (see calcs). A limitation seems to be the rise in temperature of the coolants. Since we have a square:cube relationship between surface area and volume, and since thrust and fuel flow scale with volume, and heat transfer scales with area, we get linearly more heat per kg of fuels for smaller engines than for larger. The combustion chamber transfers a lot more heat than one would expect because of the velocities of the combusted fuels with respect to the combustion chamber as the combustants move toward the center. This seems in my crude calculations to raise the fuels about 30K for the 6000lbf engine. The heat transferred from the nozzles is less than 5 times that much, and TOBECALCULATEDLATER,. This means the temperature of the cooling fuels is probably THE limiting factor of how small the engine can be made. Doubly so when realizes that the strength of metals is higher at low temperatures. For a not random example 303 (or 304) stainless is 35ksi at 70F and 150ksi at 90K, 300 series stainless is not too brittle at 90k unlike many stronger steels. Since the calculated stresses are 65ksi it is somewhat important to keep the coolant temperature within the cooler end of that range. Spin conservation of momentum: The exhaust nozzles are tilted at the proper angle to cause spin at the injectors to be 600m/s, not necessarily optimal but a good start. The engine rotates to the velocity that causes the exhaust to have zero spin. At this speed we have balance of angular momentum. At any other speed momentum is transferred to or from the engine speeding it up or slowing it down until the equilibrium is reached. Complete analysis of the forces involved in pumping the fuels accelerating the combusted gases to match the nozzle geometries, is complex, but we know the result balances, zero angular momentum in, zero angular momentum out. Pumping: We only get part of the pressure that a normal centrifugal pump gets because we leave the fluid rotating with the engine, so we can't recapture that pressure as a normal pump could. However we have all the pressure head of the column of fluid which integrates to: density*v^2/2. At 600m/s this gives us 18900 psi for Propane and 30780 psi for LOX. Note that this depends only on the velocity at the injectors and not directly on the size or rpm. Injectors mixing and combustion: Since the injectors inject the fuels with an angular velocity of 600m/s and a significant radial velocity, the trajectory of the fuels as they progress inwards toward the nozzles is somewhat complicated. Note however, that since the cold fuels are highly dense, they will have difficulty going “uphill” without getting heated. In practicality, Coriolis forces and differential velocities mean that the fuels will be mixed and heated, thus burned due to the nature of the swirling regime they are injected into. A CFD of this would doubtless be pretty, and might help quantify it, but I'm happy that it will be good enough for now that I have pushed L* a long ways in the direction of shoving more fuel through the engine, thus improving the chances that a smallish engine will not get its fuel too hot, at the expense of perhaps incomplete combustion. I expect to then push the mix all the way to stoichiometric in an attempt to cause the engine to get too hot. Isp and optimality and Thrust/Weight: The next prototype isn't isn't intended to be “optimal” except in a business sense. In particular the nozzles are intended to be good enough to get the exhaust to go supersonic at the throat, no other requirements need apply. Optimization is for later, after the engine “works”. That is after it pumps its own fuel, provides its own rotation, and doesn't immediately burn out. Then there is some room for improvement, and quite cheaply. As for Isp, why bother to guess. It should be high for the fuels, the mixing will be complete, we just have to adjust the ratios to get the optimal mix. That should be simple enough. What is more interesting is how low can the pressure drop be without sacrificing stability. In any case the pressures can be increased by using better materials. Metals are good for prototypes, and 10ksi is a good token pressure to start with, but better materials exist, for instance wrapping the outside of the rotor with carbon fiber or Dynema could help a lot, and allow us to pump to twice the pressure or so. There should be no real problems pushing the Isp in to the higher ranges possible for these fuels mostly by modifications to the nonrotating part of the nozzle. 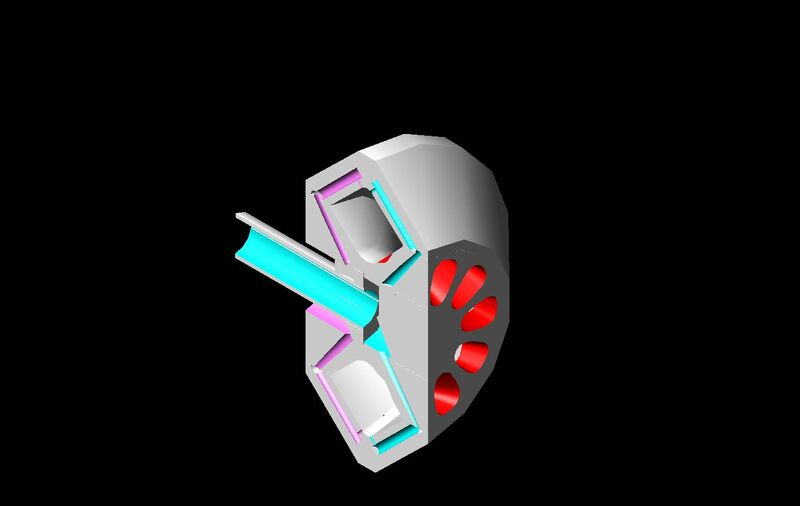 Thrust vectoring and extended bell nozzle: The rotating nozzles are enough to expand the exhaust some, however for complete expansion to ambient we need more. Several options are possible including spikes, aerospikes, various plug nozzles, and shock coupled bell or cone nozzles. There are advantages and interesting effects to many combinations of these. But one that will definitely work is a shock wave coupled bell or cone nozzle. This allows the bell to be independently gimbaled, around the correct center, for thrust vectoring. The overall objective for this particular prototype is to enable enough variations and tests to allow an engine to spinup and burn without blowing up, and to allow us to force one to fail to overheating. Thus I have pushed L* very small, and pushed the fuel rich past optimal, while having a pressure drop higher than is probably necessary to maintain stability. Simple modifications to the injectors,as noted in Sutton p will allow us to increase flows high enough to allow chamber pressures of 15ksi and mixes leaner than stoichiometric. Thus allowing both hotter and cooler mixes, and higher general flow rates. There should be enough room in the mix to allow a mix cool enough to not burn out the engine. And if stoichiometric isn't hot enough to burn out the engine, one of the follow ons will be small enough to assure that failure mode. Ground truth is necessary to tune the semi empirical equations we are using in out model, and we have to burn out one to get that. The overall design of this engine is optimized for ease of manufacture, partly to allow cheap variations for tests and modifications. Inducers and impellers: The next prototype will have a set of simple impellers to act as inducers for the fuels. Since it is simple to feed the engine with a few hundred psi, it isn't too important to optimize the impellers to reduce these pressure requirements. Since this is a “previously solved problem” in the industry, it isn't considered too important in a proof of concept test. It will be needed for a real flight ready system with ultralight tankage. Start up procedure will include an external spin up mechanism, and an external spark gap coupled ignition routed through the nozzle throat to get ignition at over 500HZ. (4/3) Pi*S^3/8 /(4Pi (S^2) /4) = S/6 for the sphere (check it if you care to). How can this be, because we all know spheres are better than cubes for surface to area ratios? The answer is ... the cube is bigger than the sphere. Bigger objects have better S/A ratios. The surprise is it balances out. Whoed a thunk it? Where does this all lead? The best I can come up with is listen to your intuition but test and train it. What it has to do with scaling up the engine is that square:cube scaling changes two things: the speed or area required to get fuels into the engine, and the relative nozzle area. The Nozzle area difference is obvious between the 400lbf prototype and the 6000lbf prototype, pictures of both are available at halfwaytoanywhere.com.